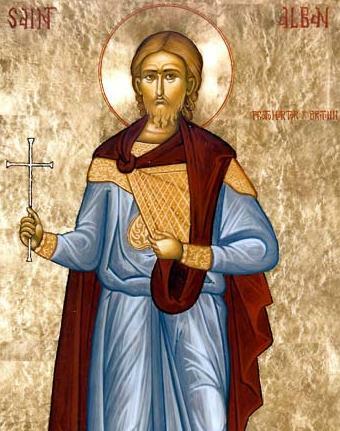 Alban is the earliest Christian in Britain who is known by name and, according to tradition, the ﬁrst British martyr. He was a soldier in the Roman army stationed at Verulamium, a city about twenty miles northeast of London, now called St. Alban’s. He gave shelter to a Christian priest who was ﬂeeing from persecution, and was converted by him. When ofﬁcers came to Alban’s house, he dressed himself in the garments of the priest and gave himself up. Alban was tortured and martyred in place of the priest, on the hilltop where the Cathedral of St. Alban’s now stands. The traditional date of his martyrdom is 303 or 304, but recent studies suggest that the year was actually 209, during the persecution under the Emperor Septimius Severus. The site of Alban’s martyrdom soon became a shrine. King Offa of Mercia established a monastery there about the year 793, and in the high Middle Ages St. Alban’s ranked as the premier Abbey in England. The great Norman abbey church, begun in 1077, now serves as the cathedral of the diocese of St. Alban’s, established in 1877. It is the second longest church in England (Winchester Cathedral is the longest, by six feet), and it is built on higher ground than any other English cathedral. 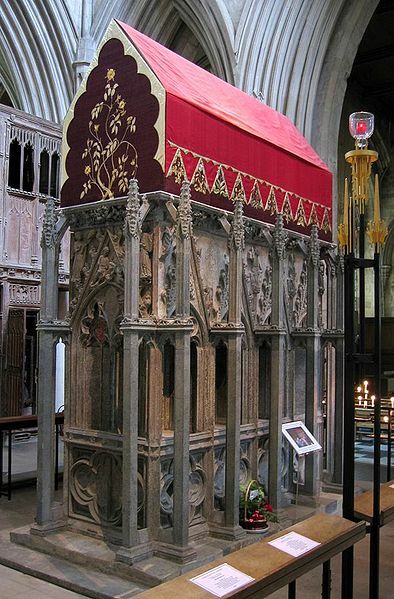 In a chapel east of the choir and high Altar, there are remains of the fourteenth century marble shrine of St. Alban. I Almighty God, by whose grace and power thy holy martyr Alban triumphed over suffering and was faithful even unto death: Grant to us, who now remember him with thanksgiving, to be so faithful in our witness to thee in this world, that we may receive with him the crown of life; through Jesus Christ our Lord, who liveth and reigneth with thee and the Holy Spirit, one God, for ever and ever. Amen. II Almighty God, by whose grace and power your holy martyr Alban triumphed over suffering and was faithful even to death: Grant us, who now remember him in thanksgiving, to be so faithful in our witness to you in this world, that we may receive with him the crown of life; through Jesus Christ our Lord, who lives and reigns with you and the Holy Spirit, one God, for ever and ever. Amen. Bio: He needs a ‘Why he is important’ statement. And, he needs a ‘He died about 304’ statement. The photograph on your site is distorted. Except for the OT reading this is all from LLF. St. Alban has a firm place in Anglican calendars, ans there is no reason to change it. The traditional date of 304 seems to come from Gildas’ misreading of the Latin for “the Emperor Severus” as “the severe emperor.” For early hagiographers, “the severe emperor” could only have been Diocletian. His persecutions of 303-313 were imagined as the most severe and the “tenth” and last (and so most poignant) of all the trails of the pre-Constantinian Church. As a result, all martyrs not firmly tied to some other specific date tended to slip into Diocletian’s reign of terror. During Diocletian’s persecutions, Britain was ruled by Constantius Chlorus (the father of Constantine), who seems to have had little taste for persecuting Christians. The revised date (c.209 CE) seems most likely and the bio should be revised to reflect that news (as per Lusk, cf. above).. That the death of Alban was substitutionary intrigues, Can this be woven into the Collect in some manner ? Is there any record as to the priest in question – did he escape ? I think the part of Alban’s story that has the most impact is the fact that even as a brand new Christian his faith was strong enough to allow him to imitate Christ by dying in another’s place, and think Richard is right that the collect should reflect this in some way. I also think that the words ‘who now remember him in thanksgiving’ are redundant, since they follow immediately words that make our remembering obvious. In view of the “recent studies”, I suggest that the subtitle should show “c. 209”. Line 2, second paragraph: add “in” after “there”.